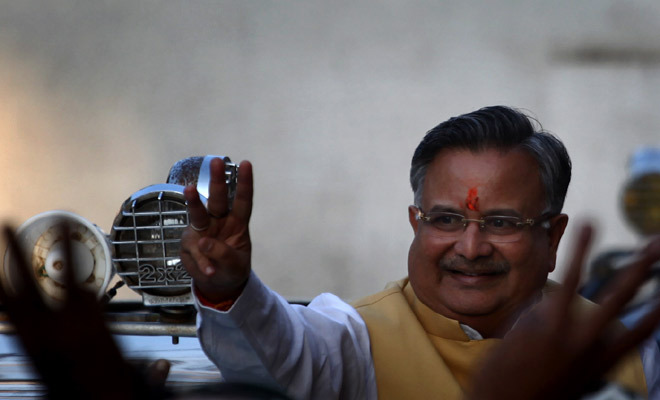 The apex court judgment, which also gives a clean chit to the Chhattisgarh chief minister's son, has raised several questions. New Delhi: A Supreme Court bench of Justices Adarsh Kumar Goel and Uday Umesh Lalit on Tuesday dismissed three writ petitions seeking an impartial and independent probe by a special investigation team (SIT) into what is known as the Chhattisgarh chopper scam. The scam involves the purchase of an Agusta 109 Power E helicopter by the Chhattisgarh government in 2007, resulting in payment of $1.57 million (approximately 30% of the total cost of the helicopter) on the basis of a spurious global tender issued in May that year for the purchase of a specific model of a specific company – Agusta – despite several other manufacturers making helicopters with similar specifications. The petitioners also sought an inquiry into the alleged offshore accounts of Abhishek Singh, son of Raman Singh, the chief minister of Chhattisgarh, “a few months after the alleged scam in the purchase of Agusta helicopter for VIP use”. It was alleged that Abhishek had links with some companies in the British Virgin Islands, and that these companies received kickbacks from Sharp Ocean Investments Limited (SOIL), Hong Kong – the dealers of Agusta. A report by the Comptroller and Auditor General (CAG) of India stated in 2011 that the procurement of the helicopter led to a Rs 65 lakh loss to the exchequer. The CAG calculated the loss on the basis of the extra cost paid by the state government due to the avoidable delay in taking a decision on signing the contract by the due date for the purchase of the new helicopter. The first two writ petitions were filed by Swaraj Abhiyan (the judgment confuses Swaraj Abhiyan with Swaraj India, which is a political party) and Rakesh Kumar Choubey, a social activist, seeking directions for an investigation into the scam. The third petition was filed jointly by the leader of the opposition in the Chhattisgarh assembly, T.S. Singhdeo, and the publisher of a journal, seeking direction to conduct an inquiry into the helicopter purchase deals in the states of Chhattisgarh, Jammu and Kashmir, Punjab, Rajasthan and Jharkhand. The bench referred to the tripartite agreement dated October 26, 2007 between SOIL, the state of Chhattisgarh and Agusta, to the effect that SOIL was entitled to retain the payment made by it to Agusta to the extent of $100,000 and $1,473,800 under the contract. The bench recorded that the CAG report does not attribute any extraneous considerations in the deal. “There is no material to prima facie hold that the beneficiary of [the] transaction was Abhishak Singh,” the judgment held. The judgment notes that in 2006, three helicopters were leading in the market in the light twin engine category, which could be utilised by the Chhattisgarh government for VIP use. They were Augusta A-109, EC-135 and Bell-427. In response to the state government’s global tender, five proposals were received, out of which three were for Agusta Westland, OSS and SOIL. All the three were handled by the same person, V. Krishnan. The other two bids, by Bell and Eurocopter, were not considered. Despite the same person appearing on behalf of three competitive bidders, the state government placed an order on SOIL on the grounds that its bid was the lowest among the three. Swaraj Abhiyan, however, challenged this claim. The petitioners alleged that in all the three offers, it was the same person who negotiated on behalf of the companies and with the state government, and other helicopters were not considered. They also alleged that an excessive price was paid to benefit the son of the chief minister. The judgment records that the son of the state chief minister is not personally a party, but does not explain why. The Wire understands that a minor difference in the spelling of the name made it difficult to make Abhishek a respondent in the case. The account held abroad reportedly carried the name ‘Abhishak Singh’, and was opened six months after the bulk of the payments were made by the Chhattisgarh government to SOIL. The account was opened in July 2008 through a company called Quest Heights Ltd, which the petition claimed was incorporated in the British Virgin Islands on July 3, 2008. Swaraj Abhiyan’s petition reveals that the address of Quest Heights Ltd is the same as shown by the chief minister, Raman Singh, in his election affidavit. It also reveals that SOIL, which appears to be a shell company, was wound up on August 1, 2008. The database compiled by the International Consortium of Investigative Journalists shows Abhishak Singh as the shareholder of Quest Heights Limited and Sharecorp Ltd. The home address of this Abhishak Singh is ‘Raman Medical Store, New Bus Stand, Ward No.20, Vindhyawasini War, Kawardha, Chhattisgarh, India. The same address, Swaraj Abhiyan claimed in its petition, was provided by Raman Singh in his 2014 election affidavit. Neither Raman Singh nor his son, Abhishek, who is now an MP, have sought an inquiry in this regard, says Swaraj Abhiyan’s petition. The Lok Sabha website also spells his name as Abhishek Singh, elected from Rajnandgaon constituency. The bench’s silence on the identity of Abhishak Singh, whose address matches that of the chief minister, is significant. Could the question be ignored merely because he is a private individual, and his foreign bank account is the subject of investigation by the SIT in another case, as suggested in the judgment? The bench has found that there is nothing on record to show that the helicopter could have been procured for a lower price. In its rejoinder submissions, Swaraj Abhiyan has pointed out that SOIL was merely an investment company, and had nothing to do with any kind of helicopter business. The bench has uncritically accepted the state government’s claim that for early delivery, a pre-sold helicopter could be purchased from its distributor at a higher price. “Thus, it cannot be said that there was an excess payment for extraneous reason,” the bench notes. The bench apparently does not lift the corporate veil and see the collusion between Agusta and SOIL, which Swaraj Abhiyan has alleged in its response to the state government’s counter-affidavit. The CAG report does not attribute any extraneous considerations in the deal, notes the judgment. But it is a reasonable inference, which the court appears to have ignored. In paragraph 16, the bench says there is “no material to prima facie hold that beneficiary of transaction was Abhishak Singh”. Of course, there is. The question is whether Abhishak Singh and Abhishek Singh are one and the same, which the court does not consider intriguing enough. The bench further adds that a case has not been made out for interference by the court in the absence of the allegation of extraneous consideration being substantiated. Apparently, the bench does not see any distinction between prima facie evidence and substantiation. At the threshold stage, the court ought not to insist on substantiation of a charge, which is the job of the investigative agencies. The court has rightly disagreed with the respondents that the petition was for political gains, and need not be entertained in the absence of a genuine public interest. Having said that, however, the bench jumped to the conclusion that the petition was without a clear element of public interest, and therefore, could not be entertained at the instance of a political rival merely on account of an alleged procedural irregularity in the decision making, which could be challenged at appropriate forum by the aggrieved party. The bench did not, of course, explain how it concluded that Swaraj Abhiyan is a political rival of the BJP in Chhattisgarh or at the national level, or how this petition lacked public interest, or the allegation is just a procedural irregularity. The petition filed by Deo – though a political rival of the BJP in the state – had impleaded other state governments, which indulged in non-transparent procurement of helicopters from private companies, and had allegedly siphoned off public money in offshore accounts through private individuals, which required thorough investigation by central agencies. The judgment completely ignores this aspect of the prayer of the petitioners.